Fed up of constant pain and strains? If you’re being hindered by ankle instability, you’re unlikely to be able to ball at your very best. Fortunately, having the right ankle brace can help solve this problem. In this buyer’s guide, we’ll review the 8 best ankle braces for basketball on the market right now. We’ll also outline some key things to consider when buying, so that you can choose the perfect stabilizer to eliminate your on-court pain. 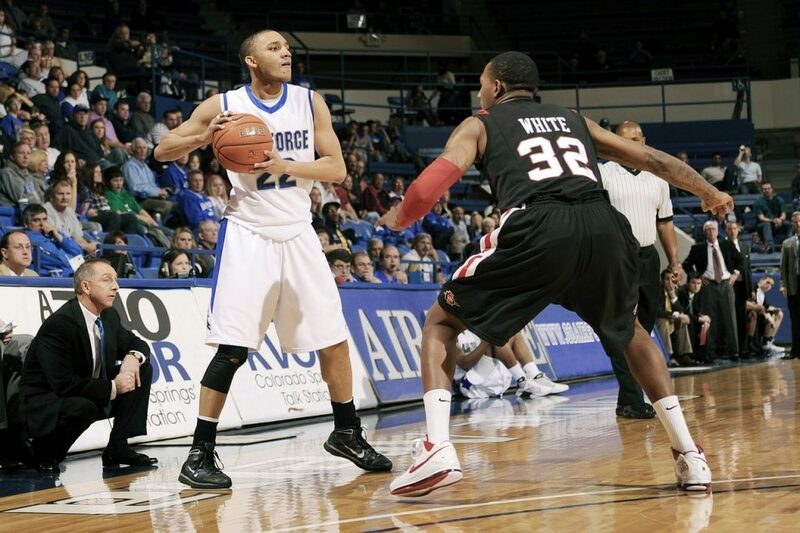 First, we’ll outline some things you should know when picking an ankle brace for basketball. 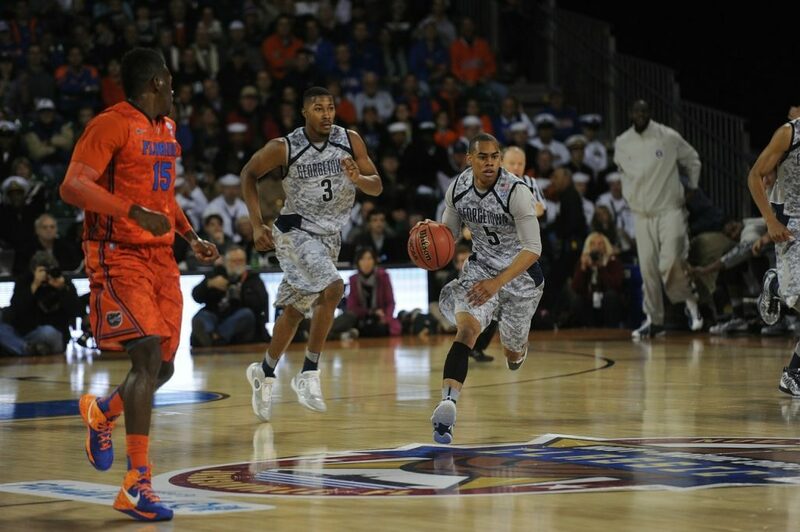 Why use an ankle brace for basketball? Understanding exactly why you’re going to be using an ankle brace is critically important. This is because different options are better in certain areas. For example, if you’re prone to rolling your ankle, you’ll want to prioritize stability – and you’ll need something durable which will last for a long time. On the other hand, if you’re just looking to heal from a one-off strain, you might want something a little more comfortable, which you can adjust to give you a little more freedom of movement as your injury heals. Ankle braces don’t just help you heal though. They’re also fantastic at reducing pain. If you pick up an ankle injury at the beginning of the finals series, you’ll want a brace that’ll enable you to run, jump, and turn with complete confidence. Once you’ve figured out what you want your new ankle brace to do for you, it’s time to compare the different designs on offer. Each one excels in different areas, but choosing the right style is also a matter of personal preference. Sleeve braces are by far the most comfortable option on the market. You simply slip them on (like a shorter, thicker, sturdier sock). Since they’re very simple, they’re often very durable, and can fit inside pretty much any basketball shoe. However, sleeve-style braces offer much less support than the two other options. Strap braces are quite similar to sleeve braces, except they have a have a piece of material which you wrap around your ankle, often over a compression-style sleeve. They tend to offer a bit more support than pure-sleeve braces, but are a little thicker. Generally though, you shouldn’t have any problems putting on your shoes (unless they’re incredibly tight). Rigid braces offer the highest possible level of support. They tend to be relatively thick, and are normally secured in place with straps, laces and/or Velcro. For serious injuries, this is what you want. Most options designed specifically for basketball are thin enough to still be used when you’re wearing basketball shoes, but you should make sure you have extra-thin socks for maximum comfort. Fortunately, finding the right size ankle brace is pretty simple. Just look at the product listing page, and check out the manufacturer’s size chart. Then, measure your feet and find your size. It goes without saying, but get a size that fits very snugly. If in doubt, go a size down. There’s nothing worse than having a brace that’s too big – your ankle will slide around inside it as you run, meaning your stabilizer will be unable to provide any meaningful support. What do I get if I pay a little more? Some things just aren’t worth spending a lot of money on. Who exactly needs a $500 kitchen knife? When choosing an ankle brace though, it’s definitely worth picking up a premium option. Why is this? Cheap braces often begin to fall apart very quickly. What’s worse: they get really smelly, and can be difficult to clean – nicer options generally have anti-microbial technology. Premium braces are (for the most part) more comfortable, more ergonomic, and offer greater support. The best ankle braces out there don’t actually cost much at all. Getting a good-quality option will only set you back $40 or so – average braces normally cost around $15-$20. As we just mentioned, ankle braces can get very sweaty, very quickly, for obvious reasons. The main way therefore to take care of your new ankle brace is to wash it regularly. Fill up a tub with warm water and a squirt of detergent. Chuck in your brace and leave it to soak for an hour. Grab a microfiber cloth and give your stabilizer a good wipe down. Add more hot water if necessary. Rinse and dry your brace. Make sure to read the label before doing this. Some stabilizers can actually be machine-washed, which is a much more efficient way of keeping your brace clean. How much will an ankle brace affect my performance? Your vertical will be slightly lower – not just from the pain of jumping, but from the impact of the ankle brace on the springiness of your shoe. Your agility will be affected somewhat (depending on how big and bulky your stabilizer is). If you’re constantly distracted by your brace, your shooting and decision-making may also be affected. We’re not telling you to avoid using an ankle brace. If you’ve got a major sprain, a stabilizer will help reduce pain and improve your basketballing ability. The key is to get the right ankle brace for your specific needs. If you pick something that fits well, is very comfortable, and provides awesome support, you might even be able to continue playing as if you weren’t even injured. Durability isn’t really much of an issue if you’ve got a one-off injury. However, if you use the same brace for a year or more, you’ll notice its stability begin to fade over time. For those with serious chronic conditions, you’re better off going with a really sturdy stabilizer from a premium brand, like Med Spec or Shock Doctor. 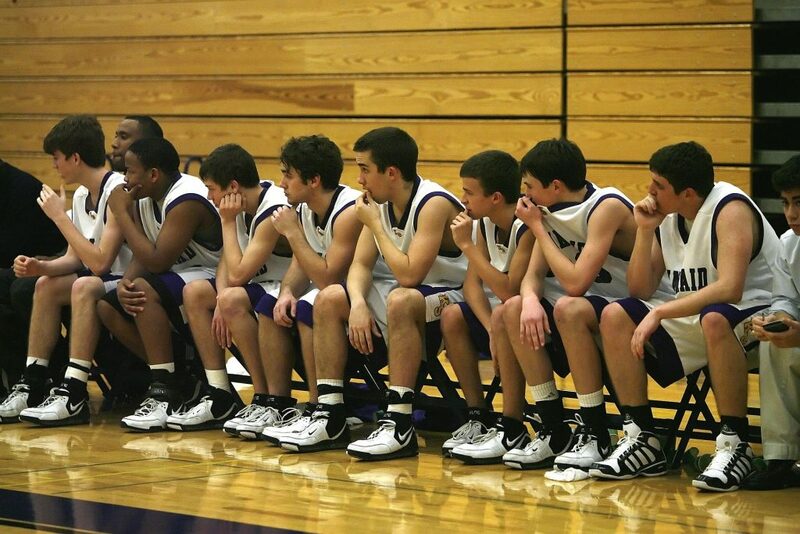 Wearing an ankle brace in every single basketball match you play can get a little annoying. Do some specific ankle-strengthening exercises. There are tons of these online – most involve using resistance bands to stretch out your ankle. Perform some balance exercises. Get yourself a balance disc (like the one below), and spend 30 minutes a day on it while watching Netflix. This helps to strengthen the ligaments in your ankle and prevent rolling. Warm up and warm down after each game, with a focus on your ankles. Draw circles in the air with your toes, stand on your toes, and lean forwards against a pole/table with your foot flat on the floor to stretch your ankle out. Reconsider your basketball schedule. 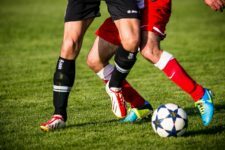 If you’re just playing games on the weekend and aren’t doing much training during the week, it might be that your ankles simply aren’t ready for such intensive activity. If you can, spread out your schedule if you’re playing pickup games, or at least do some midweek training rather than being a complete weekend warrior. Grab some high-tops. Yes, they can actually provide that little bit of extra support you need to prevent those pesky ankle strains. Want the best possible support? Zamst has you covered. You have to buy this stabilizer for either your left or right foot – it’s not a one-size-fits-all deal. Zamst have done this to provide maximum support in the areas you need it most – primarily on the inner ankle – to prevent rolling and reduce pain. They’re focused on three crucial support areas – namely the anterior, medial, and lateral ligaments. The obvious downside to having such a sturdy brace is that it can be hard to get your basketball shoes on, especially if they normally fit pretty tightly. Once you’ve done it though, this brace is very comfortable to wear in-game considering its size. You also get fully adjustable straps, allowing you to choose exactly how tight you want to wear your brace. This is especially useful for long-term injuries – you can start off with the best possible support, and loosen the straps a bit as you heal, allowing for greater agility. Plus, this brace is surprisingly breathable, and washes really well. If you keep it clean, it’ll last for ages, and won’t begin to smell. Although it costs a fair bit, we can’t recommend this stabilizer enough. The support is fantastic, but it’s still comfy enough to use when playing basketball. Excellent support around your entire ankle. Very durable & washes easily. Fits really well – sold specifically for left/right foot. If you’ve got a fairly minor ankle strain, or you wear particularly tight basketball shoes, sleeve/strap-style stabilizers might be worth looking at. Compared to the Zamst brace we just reviewed, this option is fairly basic. Essentially, it’s just a sleeve – you put it on your ankle like a sock, and then do up the strap to choose how tight you’d like to wear it. But how does it provide support? This brace uses compression technology to keep your ankle upright. The elasticated fabrics hug the ankle as you run, providing stability without being too bulky. As you result, you get the support you need without sacrificing agility. Another benefit of compression fabric is it helps to prevent slippage, reducing the chances of your brace moving around in your shoe. Plus, since the material is in constant contact with your skin, the brace helps to wick away sweat, keeping your foot that little bit cooler. What’s more, since this is a relatively simple brace, it’s fairly inexpensive. However, although the support is excellent, it isn’t going to be as good as what a rigid stabilizer offers. You have to weigh up whether the improved comfort, agility and ease of which you can put your shoes on is worth the slight reduction in support. Easy to get on, and easy to put your shoes on top of. Not quite as stable as a rigid brace. This brace from Shock Doctor is one of the more innovative options we’ve looked at. It’s a bit of a mix between a sleeve stabilizer and a traditional rigid design. There’s a compression-style sleeve on the inside, which is very breathable, although it doesn’t quite hug the entire ankle. Lining it you’ll find a number of gel pads, which offer excellent vertical support while still being nice and soft on your ankle. Overall, this is a well-rounded option for basketball, although it is a little bit on the thick side. Ergonomically, this stabilizer is as good as it gets. The tongue is pre-molded to match the shape of your foot, and the super-soft footbed is incredibly comfortable. There are also silicone bumps on the underside of this brace, preventing annoying internal slippage. Considering what you get, the price is quite reasonable. The lace-up design allows you complete control over how tight you’d like this brace to fit. However, it can be quite a struggle to get your basketball shoes on, even if you make it as tight as possible. Ultimately, the gel pads are quite thick, and there’s not much you can do about it. The 849 does come with finger tabs to make it easier to get on, but it can feel a little bulky unless you’ve got shoes that are fairly big. Sturdy, but soft on your feet. Will feel a little bit big, unless you’ve got loose basketball shoes. This is one of the rare ankle braces that’s entirely compression-based. You don’t get a strap or any laces to determine how tight you’d like to wear it. Essentially, it’s worn like an undersock. As a result, it’s obviously very easy to put on and take off, and even the tightest of b-ball shoes will be a breeze to slip on top of this brace. You don’t have to worry about laces/straps fraying or breaking – this is an incredibly durable stabilizer. But can compression material alone really provide adequate support? In this case, yes it can, for minor strains at the very least. If you’re in the final stages of recovering from an injury, or are just looking for a preventative measure, this brace is a fantastic option. However, we wouldn’t recommend this stabilizer for those recovering from serious injuries. For the best possible support, a rigid brace is probably a better option. This is by no means a bad choice though. It’s super soft, very comfortable, and its skin-hugging fabric does a fantastic job dealing with sweat. Plus, this stabilizer is also pretty cheap, and the sizing is well thought-through – it’ll work with nearly all foot types. If it doesn’t fit perfectly, Plentiiac promises to let you return it. Works with nearly all basketball shoes. Not incredibly supportive – better for minor sprains. Rigid designs = better stability but can feel bulky. Sleeve braces = not quite as much stability but more comfortable. What DonJoy have tried to do here is create a brace with all the benefits of a rigid stabilizer but without the unnecessary bulk. With this brace, you get awesome support without your shoes feeling two sizes too small. The company has achieved this by removing the heel part of the brace. What’s left over is a tough but low-profile TPU shell, which provides the lateral support you need to keep your ankle stable and prevent rolling. There’s also an EVA pad on the underside to provide a little bit of extra stability while maximizing comfort. Plus, since there are different left/right foot versions, it fits really nicely. So what’s the downside to this brace? The main con is its price: it’s fairly expensive, in large part because DonJoy have gone to such lengths to use the thinnest but sturdiest-possible materials without sacrificing stability. And obviously, it won’t provide quite as much support as a fully-fledged brace – but it’s nearly there. Ultimately, we reckon it’s worth paying the extra cash for this stabilizer. Considering it’s not a great deal of money, and the awesome agility it offers on the court (while still providing great support), you definitely get what you pay for. Plus, as the picture might reveal, it’s very breathable! Doesn’t sacrifice agility – offers your ankle its full range of motion. Expensive, but worth it in our opinion. Another rigid option is the ASO ankle brace from Med Spec. Unlike most of their competitors, Med Spec have tried to make this brace particularly shoe-friendly. They’ve done this by putting most of the bulk at the very top, which is supposed to sit outside of your actual shoe. However, this raises a problem – this brace was made with everyday sneakers in mind. If you wear high-tops, you might still find the top of the brace getting in the way. Unfortunately, this is a bilateral brace, meaning there’s no separate design for left/right foot injuries. As a result, the fit is pretty average. That’s not to say this is an uncomfortable brace. The top is made of ballistic nylon, which is nice and firm, and very supportive. In the actual foot area you’ll find Med Spec’s patented “CoolFlex” material, which is soft and breathable. The laces make it easy to adjust, so you can begin to wear it a little looser as your injury heals up. As you’d expect from Med Spec, the support offered by this brace is second-to-none. For those with serious injuries who need the best possible stability, this is a great choice. However, you will be sacrificing a little agility in return for the support provided. Not suitable for use with high-tops – the top is quite bulky. If you want something fairly low-profile, but don’t like the idea of just relying on compression technology, Liomor’s brace is definitely worth a look. This stabilizer is essentially a compression sleeve reinforced by an adjustable strap. This design has two noticeable benefits. Firstly, you can change the fit to be as tight or as loose as you desire. This isn’t possible with a regular sock-like brace. Secondly, it offers a little extra support than what a compression-only option can provide, without being too bulky. Do note though that this brace is a little thicker than most other stabilizers of this design. Another great thing about this specific brace is its price: it’s very cheap. Despite this, it’s quite durable, and very easy to clean. The lack of any material at the very bottom of your heel makes it that little bit more breathable. In addition, the design provides excellent arch support, which is a nice little bonus if you’ve got flat feet or fallen arches. Achieves a nice balance between support & allowing you a good range of movement. Obviously not as supportive as a rigid brace. If you’re still not sure what the best ankle brace is for your specific needs, drop us a comment below and we’ll get right back to you.